In July, the city moved the Right 2 Dream Too (R2D2) homeless community from a vacant lot on the edge of the Pearl District to a triangle-shaped piece of Bureau of Transportation land between the Moda Center and the Willamette River in the Lloyd District. Since that time, the nonprofit Lloyd EcoDistrict has been working with R2D2 to improve their new site and has partnered with Ebay Portland and Catlin Gabel School to launch an innovative Sleep and Recharge campaign. R2D2’s new rest area serves up to 100 people a night, providing emergency services and a safe place to sleep off the streets. Its most immediate needs are new, high-quality sleeping bags and solar-powered charging stations to power the tiny homes where the community’s on-site operators live. Solomon Olshin, a junior at Catlin Gabel school in Southwest Portland, has developed a solar-powered charging station called a JuiceBox. 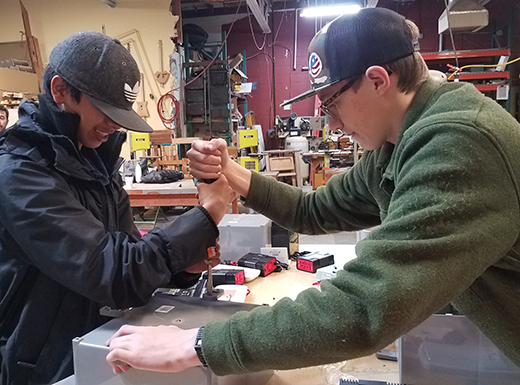 Olshin and the InvenTeam – a group of Catlin Gabel engineering students and social justice advocates – have installed the units at the Hazelnut Grove encampment in the Overlook neighborhood and at the new tiny house village in Kenton. The group has been working to contain the costs, which are about $350 per unit. Lloyd EcoDistrict – which helps the Lloyd community engage in collaborations around energy efficiency, waste reduction, alternative forms of transportation and community development – saw an opportunity to partner with Ebay Portland. The company had been looking for a local social-service initiative with a technology component that aligned with its competencies. Throughout the month, Ebay Portland will raise funds for the sleeping bags and JuiceBox solar chargers. At the end of the campaign, employees and their families will join a work party at the ReBuilding Center in the Eliot neighborhood, where Olshin and the Catlin Gabel crew will coordinate a build-out of the chargers and delivery of the goods to the R2D2 site. Following completion of the Sleep and Recharge campaign, Lloyd EcoDistrict plans to work with neighborhood businesses to build ten additional tiny homes on the R2D2 site, as well as a mobile shower and a hot box for sterilizing bags, gear and clothing. For more information, or to donate to the cause, visit www.shinewithus.org or www.ecolloyd.org.